Prof Morandotti’s group demonstrated the possibility of performing experimental studies of natural phenomena in a convenient benchtop environment. (a) Riemann pulse propagation in 500 m of highly nonlinear fiber (IBE simulation). 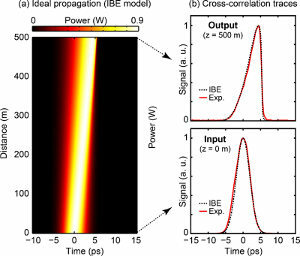 (b) Cross-correlation measurements at the entrance and the exit (500 m, at the shock point) of the fiber comparing experimental results (solid red curve) with the profiles expected from IBE simulations (black dashed curve). Our research group reports the first observation of Riemann (simple) waves, which play a crucial role for understanding the dynamics of any shock-bearing system. This was achieved by properly tailoring the phase of an ultrashort light pulse injected into a highly nonlinear fiber. Optical Riemann waves are found to evolve in excellent quantitative agreement with the remarkably simple inviscid Burgers equation, whose applicability in physical systems is often challenged by viscous or dissipative effects. Our method allows us to further demonstrate a viable novel route to efficiently control the shock formation by the proper shaping of a laser pulse phase. Our results pave the way towards the experimental study, in a convenient benchtop setup, of complex physical phenomena otherwise difficult to access.